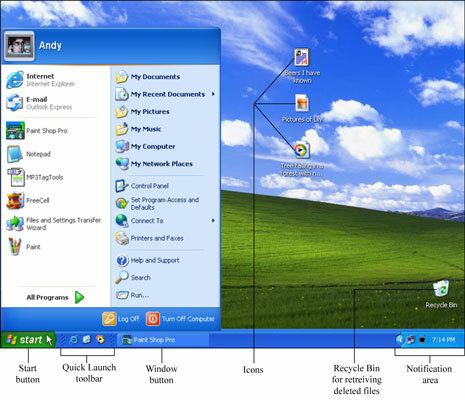 The Windows XP desktop, or computer screen background, is for running programs and working with files. Along the bottom edge of the Windows desktop is the taskbar. To begin, click the Start button to reveal the Start menu, where you can run programs, change settings,, access folders, and search for files. Rest your mouse pointer over any icon for an explanation of what it does. The Quick Launch toolbar holds frequently used programs, ready for launch with a single click. The taskbar’s notification area tells you about events like newly received e-mail or security alerts. Confused? Click the Start menu’s Help and Support icon to view the Windows XP Help menu. If you accidentally delete a file, double-click the Recycle Bin icon, right-click on the accidentally deleted file, and choose Restore to undelete it, putting it back where it was.